These are the most beautiful blossoms, aren’t they? They look like the skirt of a fairy dress, or something Philip Treacy might find inspiration in for one of his hats…something about them is so whimsical and cheerful and delightful. When dipped in a light batter of flour and ice water and deep fried, they taste whimsical and cheerful too, and always a hit at a party. And with 4 or 5 ingredients, they are incredibly easy to make. Heat up enough oil in a small saucepan so that the blossoms can be slightly submerged. Test if the oil is ready by dropping a little of the batter into the saucepan – if it bubbles up and cooks immediately, it’s ready. While you are waiting for the oil to heat up, mix together the ice water and flour in a bowl and add the salt. Don’t over mix the batter, a few lumps are fine. **If you are stuffing the blossoms with cheese, do this BEFORE you heat up the oil. Dip the blossoms into the batter and straight into the oil. Do this in batches if necessary. Leave for about a minute, turning the blossoms every now and then with a slotted spoon. Pull the blossoms out with the slotted spoon and place on a paper towel to drain. 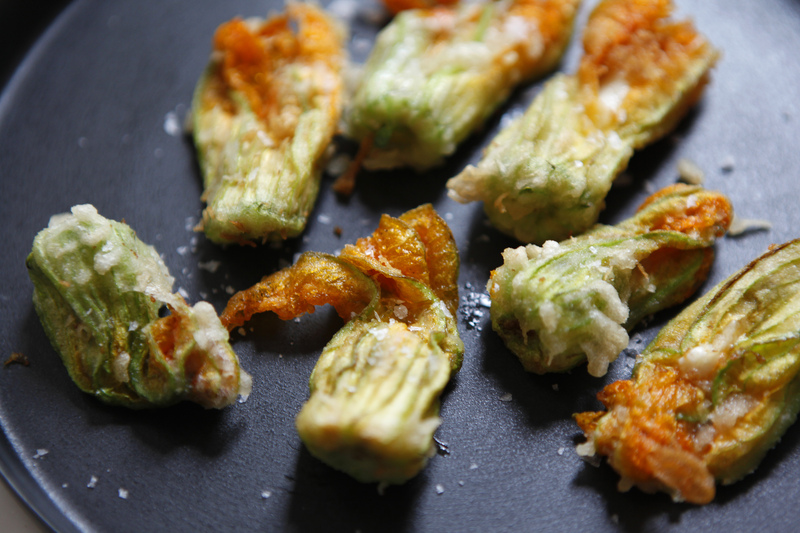 Once all the blossoms have been cooked, place in a bowl and sprinkle with course sea salt and a squeeze of lemon. 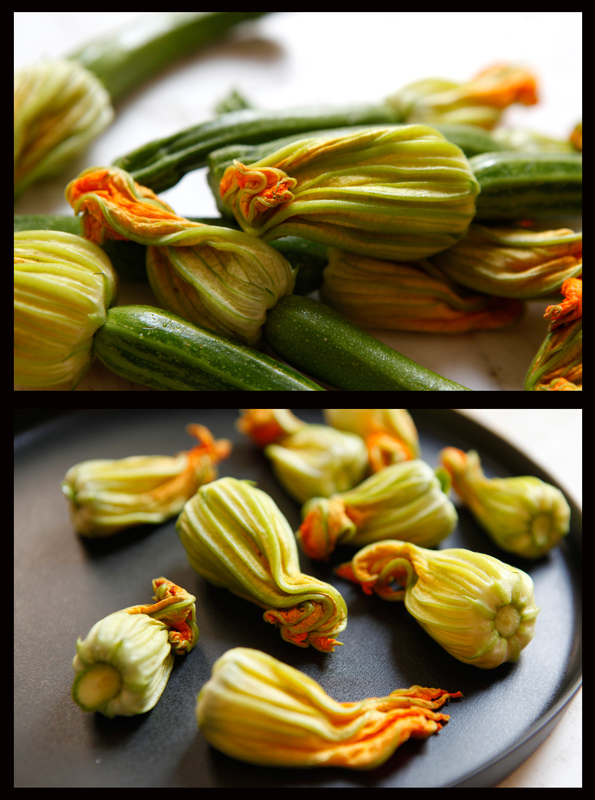 You’ll instantly feel cheerful, and probably surprised at how much like zucchini they taste! you have such pretty photos! & your recipes are so easy to follow!